Their findings are published this week in the journal Geophysical Research Letters. 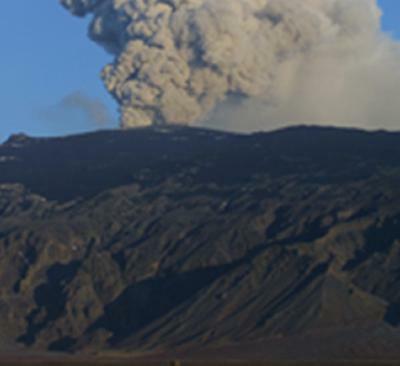 When it erupted in April 2010, Eyjafjallajökull threw volcanic ash several kilometres into the atmosphere, bringing air travel to a standstill across Europe and, in a less obvious impact, seeding the seas south of Iceland with volcanic ash. In many regions of the ocean the productivity of phytoplankton – microscopic plants that form the basis of the marine food chain – is limited by the availability of dissolved iron which is essential for their growth. Understanding ocean productivity is important as phytoplankton blooms remove carbon dioxide, a greenhouse gas, from the atmosphere. In 2007 the team showed that following a large spring bloom, phytoplankton in the Iceland Basin became growth-limited because of a lack of iron. Three voyages in 2010 allowed the science team to study whether the volcanic ash inputs from Eyjafjallajökull supplied sufficient iron to sustain the spring blooms longer than usual. The scientists – from University of Southampton, who are based at the National Oceanography Centre, Southampton (NOCS) – together with colleagues from the University of Cape Town and the Norwegian Institute for Air Research conducted three research voyages aboard the Royal Research Ship Discovery investigating ocean productivity in the area affected by ash from Eyjafjallajökull. On the first voyage, led by NOCS’ Dr Mark Moore, the team took the unique opportunity to observe and directly sample the large volcanic ash inputs to the Iceland Basin from Eyjafjallajökull, which was erupting at the time. The team’s return to the region in the summer allowed them to further assess how phytoplankton blooms developed following the ash inputs. The team sampled for ash and dust in the atmosphere, and nutrients in the ocean. They also measured the activity of phytoplankton. The team found that the five-week eruption supplied dissolved iron to an ocean region of the North Atlantic of up 570,000 square kilometres, increasing the number of phytoplankton cells. Biological experiments showed that the volcanic ash released the iron which stimulated phytoplankton growth. The effect of the volcanic ash inputs were nevertheless short-lived as the extra iron supplied by the volcano resulted in the rapid removal of biological nitrate, causing nitrogen limitation of the phytoplankton population.